I requested this book on NetGalley because I wanted to give this author another chance, and see if I was the problem since I one-stared her bestselling debut, This is How it Ends. The good news is I liked this a lot more than the author’s previous book. The not-so-good news is that this book could’ve been a lot better. Before I Let Go is the story of Corey and Kyra, two childhood BFFs who grew up in a tiny town of 200 inhabitants in Alaska. Kyra was bipolar and rejected by the rest of the town, and when Corey’s mom received a job offer somewhere else, she left her town and her best friend behind. Seven months later, she gets a phone call that Kyra is dead. They say is suicide, but she doesn’t believe it. When she flies back to town, it’s obvious there’s more to the story. First, this book is supposed to be suspense/thriller, right? But with all the supernatural vibe I got from it, it’s hard to put it into a specific genre, which is something that often takes me out of the story. I kept hoping for some explanation to the voices, “predictions” and overall supernatural-y things happening, but I was left disappointed. Something else that confused and irritated me a lot were the narrative choices. The main story was told in first person present tense, which I don’t mind at all. Then we had flashback chapters, which are always hard for me to connect with (especially when they’re repetitive and add little to the connection they’re trying to establish). But I could deal with them. My biggest problem were the script chapters. Yes. There were some chapters that were written in script format, and WTF was that about? I also kept hoping for an explanation, because that change in narrative made no sense whatsoever, but again nothing came. It was just thrown there. I honestly don’t know what purpose it was trying to serve. Can someone explain it to me, please? Then when Kyra dies, she goes back and starts confronting every single person about how they did not care about Kyra at all. Girl! Girl! The nerve! I don’t understand what they purpose of having Corey be so careless was. Whatever it was, it wasn’t worth the risk of making her unlikable, which was what it did for me. I found myself getting irritated with her every time she confronted Kyra’s parents or the rest of the folks in her hometown. Also, repetition ruled this story. Corey had the same conversation over and over and over again, and it was completely unnecessary because I had already gotten the idea behind the whole mystery. Since this was supposed to be a thriller, I was expecting something with a little more mystery to it. But there was no build up. When Corey arrives at her hometown, people are already super weird and the hints about what they did to Kyra were already too strong. There was no going from “oh, this town is nice and cozy” to “OMG, this is creepy.” We started with creepy and kept that pace. There was little find out. Little possibilities to explore. The motivation for what happened was also a little weak. I get that desperation and hope can change people—even 200 people. But to think the ones that loved Kyra the most would behave in the matter they did? And that there’d be no sign of regret? I don’t know if I can buy it. But I blame that on the lack of character development. Aside from Corey and Kyra, everyone else was interchangeable, even Kyra’s parents. On the other hand, this book was quite addictive. I read it superfast, and the beginning did make me curious about what would happen next. It would’ve benefited from being a littler shorter, but I didn’t consider DNF’ing it at any point, which I can’t say about many books lately. I also loved the setting—a tiny Alaskan town. I thought it helped with the eerie atmosphere the author tried to create. Again, I would’ve liked the town folks to have distinguishing personalities and for the supernatural vibe to have been clarified, but I think the setting in itself was a positive thing. 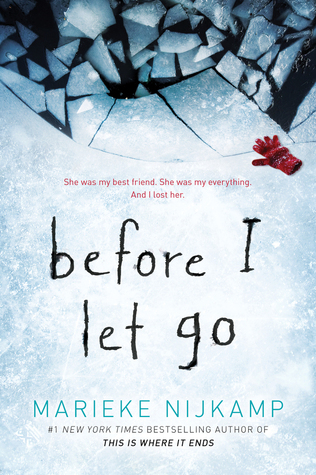 Before I Let Go was different than what I normally read, and it was a better experience than the author’s debut. I don’t know if I’m the right reader for this author, but I like her premises, and if she comes up with something else that peaks my interest, I may check it out again.